Standard Sequences for Hearing Aid Test – ANSI S3.22 and IEC 60318-7 – Listen, Inc.
All the major tests from the ANSI S3.22 and IEC 60318-7 hearing aid test standards, and some of the additional ‘Annex C’ sequences from the 2003 ANSI standard. These sequences include all the major tests from the ANSI S3.22 and IEC 60318-7, hearing aid test standards, as well as some of the additional ‘Annex C’ sequences from the 2003 ANSI standard. Each hearing aid test test, as outlined in the standards, is contained in a single test sequence. These sequences can each be run independently and will recall the tolerances created in the Limits Entry sequence. There are also several full test sequences, which call up the required individual tests to run a complete standard test suite. The names of the full test sequences are bracketed by dashes to separate them from the individual tests. These sequences are meant to be run from an exported state, meaning that there is no need to use the ‘import’ function in SoundCheck. Once you have unzipped the main folder, you can run the sequences directly from their exported folder. In SoundCheck just click File -> Open, and navigate to the Hearing Aid Standard Sequences folder. If you have already configured the step ‘Hardware Default’ in your main SoundCheck directory to match your system setup, choose that. Otherwise choose a step that matches the name of your audio interface (i.e. Lynx 2, Multiface II…etc.). Once the new step is loaded click ‘Save As’ at the bottom of the editor, and overwrite the Hardware Default step in the Hearing Aid Standard Sequences folder. This will ensure that your chosen hardware step is used in all of the sequences contained in the folder. Follow the step by step instructions for connecting the hardware, and use the diagram below for reference. Connect the Left or Output 1 of the audio interface (sound card) to the left input of the stereo amplifier, and connect the Right or Output 2 of the audio interface to the right input of the amplifier. 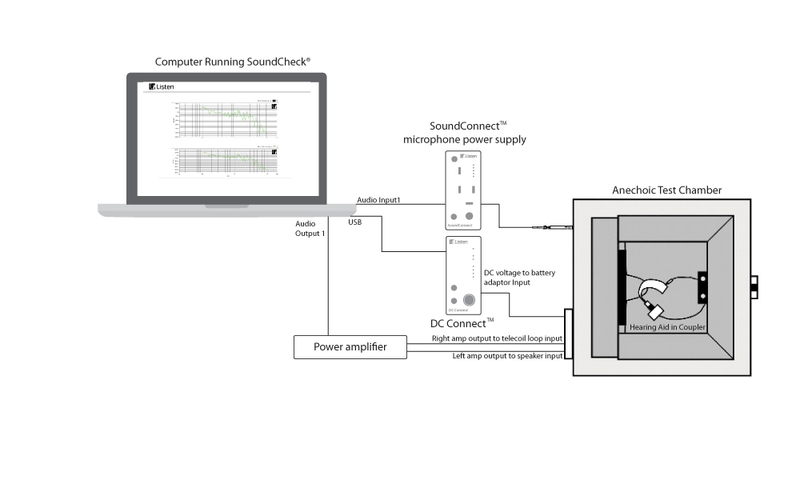 Connect the left output of the amplifier to the speaker input of the anechoic test box. Connect the right output of the amplifier to the telecoil loop input of the anechoic test box or an external Telephone Magnetic Field Simulator (TMFS). Connect the 2cc coupler microphone to the input of the SoundConnect power supply. Connect the output of the SoundConnect to the Left or Input 1 of the audio interface (sound card). Turn on DC Connect, then connect it to the PC’s USB port. If the DC Connect is turned on after plugging in the USB cable the driver may not load properly. Connect the DC voltage output of the DC Connect to the battery adapter input on the anechoic test box. Calibrating the microphones from your setup is the first step. The procedure for calibrating the coupler microphone (after removing it from the coupler) and calibrating the reference microphone is exactly the same. The only difference will be which signal channel you select in the calibration editor. Click the ‘Input’ tab, and select either the Coupler or Reference Microphone signal channel from the dropdown box. Connect the microphone to the SoundConnect. Then insert it into the calibrator. Turn the calibrator on. In the microphone calibration window first set the calibrator to correspond to your calibrator or pistonphone, e.g., B&K Type 4231. Under ‘Measurement Microphone’ select your device from the list. If your microphone is not listed choose Other Microphone. This only sets some default limits around the sensitivity result. Click ‘Calibrate’, and you should see the yellow level bar read the signal from the microphone. You may wish to click the Calibrate button a few times to ensure that the level is stable. Once you are satisfied with the result, click ‘OK’. Before proceeding to the next part of calibration you may wish to save the step. To save the calibration results, click ‘Save As’, and overwrite the existing step. You must calibrate the microphone that you intend to use for the speaker calibration before proceeding. Position the microphone on the target in the box. A pressure microphone should be oriented at 90° to the main axis of the source, as in the standards. Remember to close the box lid. Click the ‘Output’ tab, and select Source Speaker as the signal channel. At the bottom of the window there will be a drop down box under ‘Calibration Sequence’. Choose Anechoic Room Calibration from the list. Note: The names of the output calibration sequences do not indicate their sole application. Anechoic Room Calibration is the most comprehensive sequence in the list, as it allows multiple iterations to fine tune the equalization. It is the recommended sequence for calibrating any acoustic source speaker. Directly under the calibration sequence is a dropdown box for ‘Input Signal Channel’. Depending on which microphone you are using for the calibration select Coupler or Reference Microphone. Click ‘Calibrate Device’ to begin the calibration sequence. You will first be prompted to enter a calibration level in dBSPL. For this application 70 dBSPL is recommended. A stepped sine sweep will play, and the response of the speaker will be analyzed. A second, equalized sweep will then play, and the second result will be displayed. You may choose to accept this result or run the sequence again to fine tune the equalization. When you choose to accept the calibration you will return to the editor. To save the calibration step, click ‘Save As’, and overwrite the existing step. Regardless of whether you are using a telephone magnetic field simulator (TMFS) according to the ANSI standard or the 4232 telecoil loop according to the IEC standard, the first step in calibration is to measure the gain of the amplifier. Connect a cable directly from the output of the amplifier to the ‘Right’ or ‘Input 2’ of the audio interface, forming an electrical loop-back with the amplifier. Click the ‘Output’ tab, and select Telecoil as the signal channel at the top. At the bottom of the window there will be a drop down box under ‘Calibration Sequence’. Choose Amplifier Calibration from the list. Directly under the calibration sequence is a dropdown box for ‘Input Signal Channel’. Set R as the input signal channel. Click ‘Calibrate Device’ to begin the sequence. A stepped sine sweep will play through the amplifier, and then you will see a response curve and a gain value. When the sequence is finished you will be returned to the calibration editor. You will see the measured gain of the power amplifier in the sensitivity field. Enter the Final Sensitivity value into the Sensitivity dB field of the calibration editor. To save the calibration step click ‘Save As’ and overwrite the existing step. Before using any of the other sequences in the suite, the sequence entitled Limits Entry must be run. 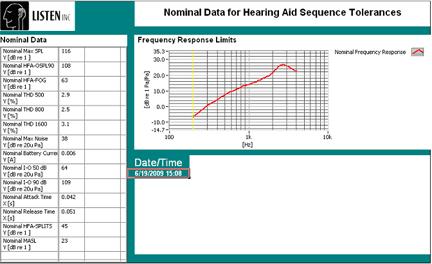 This sequence displays a series of prompts enabling the user to enter the nominal parameters for a particular hearing aid. The sequence then automatically offsets the nominal parameters according to the standards and saves tolerances for use in each of the individual test sequences. At the start of the sequence a prompt asks whether to create a new set of limits or recall them from a file. This allows the user to have stored sets of data for various models of hearing aids and easily recall them later. The very first time running the sequence, however, a brand new set will need to be created. The recall and autosave steps are all set to use the default file path, which is typically C:SoundCheck 8.1data. The message steps guide the user through the sequence until all parameters have been entered. If the device to be tested does not require some of the tests (like telecoil or AGC), the user can choose to simply not enter a value and click ‘OK’ to continue through the prompts. After data entry is complete the user will be prompted to choose a storage location and file name. This data will be stored as a .DAT file and can be recalled by the limits entry sequence in the future. A second .DAT file is created automatically, and its purpose is to keep track of the current ‘active’ set of limits. This file is recalled by all of the individual test sequences to establish tolerances. At the end of the sequence a prompt asks whether the user would like to see a report of the limits. If ‘Yes’, a display appears, showing all of the entered parameters and a graph showing the nominal frequency response. If Excel is installed on the PC, a report will automatically be generated from this display, which the user can save and/or print. Please contact your Listen sales engineer or representative for more information and pricing on this sequence.